A receiver has already become an important and a must-have thing in our own vehicle especially car. Every car nowadays also has already equipped with this device, the functions are so many. The main purpose as an entertain tool as long as we are in the car of our trip. We can listen to the music, call friends, and listen radio streaming. Because of many company has produced this device, we will make you know a brand namely Pioneer. Also, we will do comparison between the products with different series from Pioneer AVH X7800BT and Pioneer AVH X7700BT. Pioneer AVH-X7800BT is a receiver with touchscreen and a single-DIN dash. In this device you will get bluetooth technology. By this, you can enjoy hands-free calling with your phone and stream or control music too. The plus thing is also supporting two paired phones at once. What is the new thing about Pioneer? Pioneer’s Touch Slide technology and NEX interface add new dimensions to fingertip control. Only with your iPhone, you can connect it to the rear USB input cable to be able to use the receiver’s controls. Spotify and Pandora control are application streaming radio that you can also enjoy on Pioneer AVH-X7800BT, just connect your iPhone via USB or pair up your Android with Bluetooth and you are all set. This receiver’s powerful built-in amplifier delivers the volume you’re looking for, while the 13-band equalizer offers plenty of ways to tweak the sound to your liking. And Pioneer’s Advanced Sound Retriever perks up the flat sound of compressed music by restoring high-frequency information. 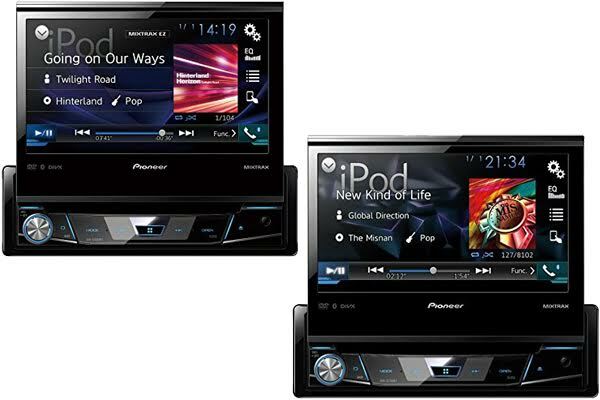 Pioneer AVH-X7700BT is a receiver that featured with large touchscreen folds out, 7 inches of full-on car entertainment in seconds, and USB port. This multimedia player that can connect to a compatible iPhone or Android phone using a single USB cable which will allow you to control compatible applications from your dashboard in a convenient and safe way. It also can play your audio/video content from CDs, DVDs, and USB devices. There are Bluetooth for allowing you to stream your music and call hands-free over a wireless connection and Sound Retriever for listening to your music in great audio quality. It is equipped with 13-band graphic EQ, auto EQ and time alignment allow you to customize the sound setting to your own preferences. It is also equipped with Siri Eyes Free that can use as device to ask questions without taking their eyes off the road. Based on the review we got, seems like Pioneer AVH X7700BT is better than X7800BT, the reason is simple, the products has been bought and liked by many customers. Probably, because the features and functions are well done enough for them too. We do not say that X7800BT is bad, but in order to make a decision, we would recommend you Pioneer AVH X7700BT.